There generally isn't a lot of ice where I live now. Enough to skid out in the dark, but not much to photograph--or to describe, since black ice seems to demand an absence of description. It's an unseeable hazard, or a cold mirage, flip side to the illusory oasis all those cartoon desert stragglers seem to see. 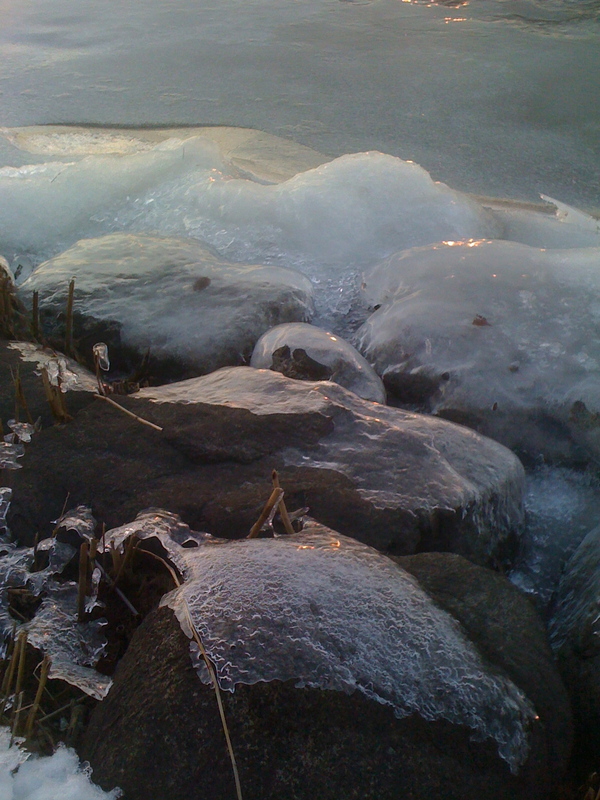 Not quite ice as arrested motion--river ice, lake ice. When I was a kid, we used to skate on a nearby shallow lake. I remember a brief flirtation with speed skating--arms pumping, head down, amazing grace, exhilaration. Then wipeout, sprained ankle, hot water soaks, purple bruising, crutches. Toes so cold it still surprises me some days to find I still have ten. Earlier this month, in Boston for the MLA convention, I huddled indoors, taking full advantage of the convention center-mall-hotel-enclosed walkway complex that meant we never had to go outside. But that gets old. It can't be healthy, even if it's warmer. So I went for a quick, near-sunset walk along the river. It was supposed to be a speed walk (arms pumping, head up, no sprains). 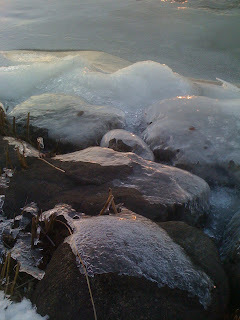 But I found myself taking ice pictures instead. Grainy, soft, unremarkable, curious, not-quite-transparent, nowhere close to spring pictures. What if the water were still moving underneath? pictures. Look at the rocks people have thrown to test the ice pictures. How soon do you think it's going to get dark and does ice hold shadow as well as it holds light? pictures. Even invisible ice demands description pictures.